If you like, you can import the commands from the Backup Ini file in the program QTP as of version 4.11! If you use different profiles for text selection fields and Windows command which can be accessed by keyboard shortcut It is handy if you can import them. In one of the following versions I will expand it so that you can do it directly in the program and switch between the profiles, for now this simple solution via the backup function. 1.) ... Importing the * .ini file! 2.) ... Activating the Auto Backup function in QuickTextPaste! 3.) ... how can I transfer the settings or texts to another PC? See also: ► How to Paste plain text from the clipboard via placeholder? 1.) Importing the *.ini file! 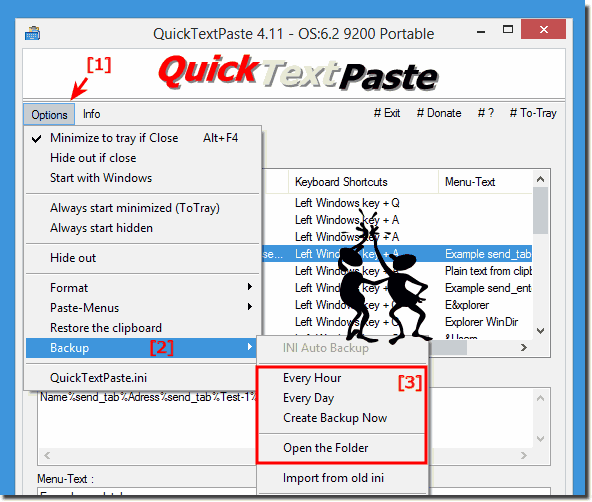 Simple click or tap on Options Menu in QuickTextPaste select the menu entry Backup! 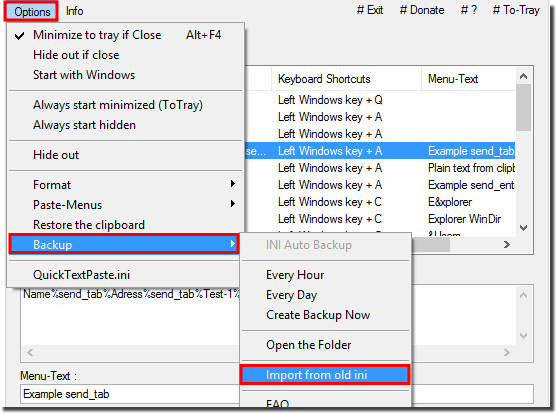 (Image-1) Import Text and Windows Commands from old ini file! 2.) Activating the Auto Backup function in QuickTextPaste! Please click or tap on Options Menu in QuickTextPaste select the menu entry Backup! The Program will auto create the Backup Folder and auto save ergo create a backup of the QuickTextPaste.ini with the Timestamp (Reverse-Format) in the File Name. Not lost the Windows text snippets and command that make the work on Windows PC faster and save so much time. You want to create an auto backup every hour or on time per day please select this option! The Auto-Backup will be create only if change or add new Commands and taking into account the personal settings. (Image-2) Auto Backup Feature in QuickTextPaste! Transfer Quick - Text - Paste settings or texts to from one to another PC! ► ► ► use the Auto Backup function in QuickTextPaste! ► ► ► Importing the * .ini file! Easy, Smart and clean solution! QuickTextPaste - FAQ-31: Import Text and Windows Commands from old ini file! Today I have a question about the program QuickTextPaste. After the update to the version 4.04 those are created by me Shortcuts disappeared, although these are still in the (1.) ini file are apparent. Curiously enough, the (2.) ini file (call via the menu item "Options") empty. It seems like it would There are two ini files that are mutually exclusive. Maybe I did something wrong during the update process you may import the 1st. ini file into the program, which is generally would be very desirable, since one such and the same ini file for example, on the PC and laptop can use. I really like your program QuickTextPaste, in my opinion it's currently the best that's out there and it's the only tool to fulfill my current needs. Unfortunately QuickTextPaste always crashes when importing a back-up. I'm using the zip version. Secondly I plan on using it in such a way that I can use the backups as different 'profiles'. Could it perhaps be a possibility to include some kind of profile option? Or a function that it checks for a backup file with a user specified name in its current folder? That way I can just duplicate the .exe file in different folders since the tool is really small. I need such an option otherwise the tool can't be of great use to me and my college's unfortunately.